To celebrate our 128 years of rich history, we must first understand our beginnings. The Berlin Board of Trade, which later became the Kitchener Chamber of Commerce, established itself as a significant business voice through many early projects: initiating the municipal ownership of the Berlin and Waterloo street Railway company, studying a system of “cheap telephones,” campaigning for free mail delivery service, and calling for a new industrial policy. Four years later, in the neighbouring town of Waterloo, Julius Roos and Mayor George Moore organized another public meeting of town business people and the Waterloo Board of Trade, later became the Waterloo Chamber of Commerce. As in Berlin, The Waterloo Board of Trade’s early contributions to the town were significant. Under the leadership of president Christian Kumpf, the group campaigned to purchase Jacob Eby’s farm to create Waterloo Park; sought William Lyon Mackenzie King’s help to establish a post office and federal building; and arranged for the town to donate 5 acres of land and purchase a house on Albert street, securing a home for what is now Wilfrid Laurier University. In 1895, the village of Elmira followed suit and established the Elmira Board of Trade, under the leadership of President Dr. Ullyot, which later became the Elmira and District Chamber of Commerce. 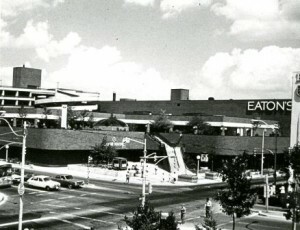 Their early meetings in the Elmira library began in promoting the progress of “Enterprising Elmira” and the surrounding district. The Board of Trade supported early and diverse industries, from felt companies and shirt manufacturers to dairies, shoe manufacturers and tanneries. Like Berlin and Waterloo, Elmira’s industrial legacy began a long lineage of family names, entrepreneurship and community leadership, such as Martin Feed Mills and Seiling Hatcheries. Though each Chamber was established at different time and served its own unique members and communities, the similarities are what created the Greater Kitchener Waterloo Chamber of Commerce.